To coincide with the new MCS time use diary and accelerometer data release, CLS Survey Manager, Dr Emily Gilbert discusses how the use of new technology has enabled us to gain new insights into the lives of the millennial generation. How you spend your adolescent years can have implications for the rest of your life. 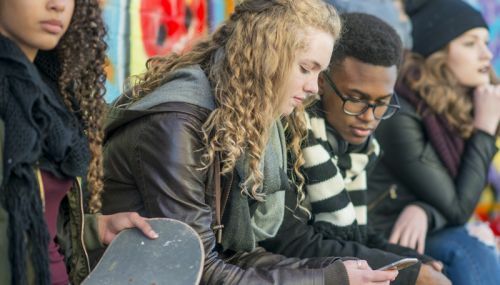 Here at the Centre for Longitudinal Studies (CLS) we have been able to capture detailed information about the day to day activities of thousands of UK teenagers who take part in our Millennium Cohort Study (MCS), providing an unparalleled resource for researchers. The MCS Age 14 Survey was the first large-scale population study in the world to incorporate objective measurement of physical activity using accelerometers alongside self-reported time use for the same period into a social survey. It’s also the first large-scale study to make use of new technologies, including both a specially-developed online diary and bespoke smartphone app, to collect this data. We embraced new technologies both in order to capture this highly detailed data in all its richness, and also to make the tasks more appealing to this age group, and thereby help engage them and improve response rates. Just over 10,000 study members were asked to wear a wrist-worn GENEActiv accelerometer to measure physical activity for two randomly-selected days – one on a weekday and one day at the weekend. On the same two days, study members were asked to complete a time use diary, available in three different formats: an online diary and a smartphone app as an initial first option, with a traditional paper diary for those who could not or refused to complete the diary in an electronic method. So, how successful were we at persuading 14-year-olds to take part? Of all eligible respondents, we collected valid accelerometer data for both selected 24-hour periods for 41 per cent, and a further 7 per cent for one selected day. Validity was assessed against a common benchmark of at least ten hours wear time for each 24-hour period. These rates are broadly in line with the rates seen for other large-scale studies in the UK. In terms of the quality of the time use diary data, measured using a number of ‘gold standard’ indicators, the app and online diaries outperformed the paper version – and all three versions achieved higher rates of good quality diaries than many other teenager and adult time use surveys. Interviewers played an important role in encouraging young people to complete the two tasks. Additionally, we had a carefully thought through reminder strategy, involving both the young people and their parents. Implementing the accelerometers in particular at this scale within a specific time frame presented several logistical challenges. Careful planning was required in rotating accelerometers across participants and keeping track of them in field. We also had to make sure interviewers knew to regularly charge them, so that when they were handed over to the participants there was enough battery life to collect the required data. As we knew there was not a large enough supply of accelerometers to cover all of our very large cohort, we decided up front to collect the data from a subsample of the whole group. To have large enough samples to make country comparisons possible we included all participants in Wales, Scotland and Northern Ireland, and a random selection of 81 per cent of participants in England. The combination of objective physical activity and self-reported time use data is a remarkable resource, which will provide the research community with a unique insight into the lives of 14-year-olds in the UK today. It will also be a valuable longitudinal resource, allowing researchers to see how time use and physical activity at 14 relates to childhood, as well as the influence it will have over the life course. Additionally, we hope our experience of collecting this data in a large-scale longitudinal study will be of benefit to other studies that may be considering a similarly ambitious exercise. Find out more about how we designed and implemented these elements of the MCS Age 14 Survey, read our working papers on accelerometers and time use diaries. Learn more about what the teenagers’ time use diaries tell us. Download the data from the UK Data Service.